Imagine for a moment that you had no pressures in your life no problems to fix, no deadlines to meet, no struggles to overcome. Do you feel that sense of spacious relief? It s not an illusion, teaches Mary O Malley. It really is possible to live with that profound openness all the time, even while tending to your everyday tasks and obligations. In What s in the Way Is the Way, Mary offers practical guidance for meeting all of your experience with an abiding sense of ease, trust, and peace of mind. This accessible book is divided into ten phases, featuring inspiring wisdom and step-by-step exercises to heal the core beliefs that keep you stuck. With each chapter, Mary invites you to come into the present and see yourself and your circumstances in a different way unclouded by preconceptions, struggle, or fear. Join her on this illuminating journey to discover: How fear controls our lives untangling the conditioning that keeps us from trusting our complete experience The healing power of curiosity a natural way to meet our lives without needing to change or judge anything Trusting what happens even when we feel threatened, ashamed, or afraid Why we become more active, engaged, and effective when we stop doing life and start being fully present for our lives Remembering exercises simple, powerful practices for reconnecting with our natural state of curiosity, trust and love No object, person, or experience will ever bring you the deep and lasting peace that comes from simply being open to life, writes Mary. With What s in the Way Is the Way, this renowned teacher brings you a powerful guide for turning your obstacles into your greatest allies and teachers and showing up for your life with all your vulnerability, passion, and magnificent perfection." Start reading What's in the Way Is the Way on your Kindle in under a minute. "Awakening is powerful medicine. A book to live with, learn from, and treasure." "These teachings open you to mystery; they bring freedom, joy, and ease." "This is the most no-nonsense, grounded, accessible spirituality you will ever come across. I love Mary's teachings. They are simple and practical yet awesomely profound, and offer hope to those in even the darkest places. Her message is medicine for the world." "This beautiful book is filled with heart wisdom. Mary O'Malley's teachings are simple, deep, and profoundly transforming . . . they will guide you in letting go and trusting life." "Down-to-earth and joyful! Mary's words offer a healing path for all who wish to travel away from self-limiting views toward freedom of heart." "A gentle, loving guide to a happier and more peaceful life. Everyone can benefit from the wise words in this book." "Mary O'Malley's book shares meaningful information and wisdom. I know from my experience that she speaks the truth, and her guidance can make a significant difference in how we manage our journey through life." "I consider Mary O'Malley to be one of the most extraordinary teachers of our time. No one is more adept at showing us how to turn life's most difficult moments into life's greatest gifts. Her deep compassion, uncommon awareness, and crystal-clear insight make anything she writes a treasure." "In a world where we are pathologically encouraged to dismiss aspects of our authentic experience, this book is deeply welcome. With beautiful hearticulation, Mary O'Malley invites us to give voice to that which has been buried, illuminating pathways for transformation that are desperately needed in this mad world. An invitation to presence. An invitation to inclusivity. The wholly holy. This book comforts me." "I loved Mary's message--for me, born with an overdose of curiosity, it gives new meaning and usefulness to the word!" "Mary O'Malley is a genuine master, a sensible, plain-speaking exemplar of spiritual awakening and illuminated guidance. Every word in this book rings true. I loved it." "Mary O'Malley has developed a wonderful process to let go of struggle and become more fully alive. She teaches us to use compassionate curiosity to bring insight to the healing of whatever is getting in our way." "I love the title of Mary's book, What's in the Way Is the Way; it says it all. Her wisdom about gentleness and compassion, especially with ourselves, is so essential to take in. We all have a contribution to make to the evolution of peace and healing for our world and--as so many great teachers have said--it needs to start with ourselves. Mary O'Malley offers a timeless teaching. Now, may we each live it to the best of our ability." "Mary O'Malley's amazing book is testimony that our most trying challenges bear with them the seeds of our most inspiring triumphs!" "I am just in awe of Mary's work. Mary transforms our everyday challenges into something sacred. Her insights into what it means to be truly human touched my heart so deeply. I think Mary O'Malley is the freshest voice of truth out there today." "Mary offers a graceful and skillful communication, a quality of responsiveness that is seasoned and not commonly seen." "Out of the plentiful garden of books out there on spirituality that get too heady or are not experiential enough to really help people, this rare gem is different. I love how Mary adds just the right combination of explanation and instruction." "Mary's work is fantastic and so important in helping people on the path to both personal freedom and more wisdom on the planet. Mary's new book brings a vital focus to the intelligence of the heart, to the power of breath and to the awakening of the human spirit." 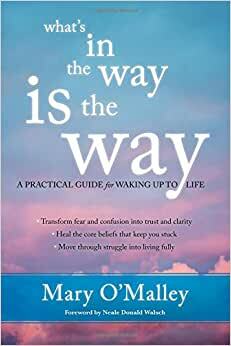 "The title of Mary O'Malley's book, What's in the Way Is the Way, says it all. It's a mantra we can repeat. By opening her book to any page, we are reminded of our 'cloud banks of struggle' and how we can gracefully move out of the struggle and the confines of our limited perceptions. It's a book to take wherever you go." "In reading the book and doing the work, I felt as though a thousand pieces became a workable and digestible whole. It is brilliant in its simplicity and unparalleled in its ability to touch that soft spot we all have, the one that says me and my life matter, and we are in this together and not alone." "Mary once again offers a gentle clarity that invites us to embrace ourselves and our circumstances, our experiences and our dreams. She invites us to undertake this journey not with willfulness, but willingness. Mary is truly a treasure, the pearl of great and rare value." "Humans today are being asked to make a profound leap in consciousness. We are the first generation in 200,000 years to know that the universe is not just a space filled with various objects, but is in fact an ongoing creative process. No longer can we think of ourselves as separate individuals trapped in a tiny world. We are in fact a wave of creative energy that has been traveling for 14 billion years. With her new book, What's in the Way Is the Way, Mary O'Malley has created a process where each of us can enter into this deep truth of ourselves. By following her lead--by learning to dwell in our deep nature as a daily practice--we come to feel that joy of astonishment that accompanies every great awakening of love." "This book is a powerful resource for anyone seeking peace, well-being, and freedom from internal struggle." "Reading a book is one thing. Being joyously changed while reading it, right there, on the spot . . . is another. Mary O'Malley does that, repeatedly, and with élan and deep wisdom. She glides you into a consciousness that is alert, realistic, and transformative. Her teaching is direct and full of felt life, quietly guiding you away from disturbing emotions and drifting thoughts of oppression. Her gift to the reader is immeasurable because it is so present and full of the eternal presence." "Mary's book is a laser-like guide for people of all stages in life treading the path of self-inquiry. In plain-spoken words, Mary gives the reader a challenge to change our perspective from ego-based to soul from which we can transform fear into love." "I love Mary's style. It's obvious that her words come from an honest heart--one that has known both rapture and heartbreak. Mary has learned to live in a way that's open to life. This book shares in a very clear and concise way how you too can learn to use what's in the way as the way to your own personal freedom." "It is a sincere relief to read a book that so clearly demystifies the precise things which I have been working on lately. With What's in the Way Is the Way, Mary O'Malley has scripted a pathway through confusion into the light of our own consciousness. It is chock full of signposts and refuses to allow you to remain lost. This is a book that everyone should read, particularly those whose lives have been touched by addiction (and that is everyone)." Mary O’Malley is an author, counselor, and acknowledged leader in the field of awakening. Through her writing and teaching, she empowers people to work with the difficulties of life in a way that enhances their capacity for joy. For more, visit maryomalley.com. This is a rare and extraordinary book. It's author has been through it all and therefore understands how many of us feel or have felt. It is the use of powerful metaphors like the meadow etc that gives it a clarity I can connect with easily. Thank you Mary for this gift. 5.0 out of 5 starsLoved every moment of this book. Very practical and applicable to every day living. Thank you Mary: a great book to revisit again & again. Great, practical guide to find peace, acceptance, love. I've read HUNDREDS of books on this topic from Krishnamurti to Pema Chodren to Adyashanti to Jack Kornfield to Eckhart Tolle, and this book is right up there at the very, very top - if not THE top. Mary speaks in such everyday terms with amazing first-hand clarity. What I love most is that she tells you HOW TO go about finding the present moment and HOW TO overcome all the garbage in your brain - instead of just telling you ABOUT it. Highly recommended - a great read. This book is an amazing read. It covers everything you need to know to get the clouds out from around your head, and walk into the meadow of joy and happiness no matter what is happending in your life. Follow the instruction of letting life flow through me has freed me from all the upsets I am experiencing in my life now which have been the worse period in my life since I came on the planet. Law suits, personal attacks, being dumped by someone I was in love with, selling a house of 28 years, and moving into an apartment. The author does not give personal stories rather provides quotes from wonderfully wise people. Easy to read with wonderful exercises to bring you into your meadow of joy and happiness - by letting life do its work and just reaping the benefit of life's care taking of you. Also provides great information on how to see the spells that operate you everyday and how they are so wrong. Buy this book, and if you read it with an intention to change your life to one of happiness, joy, love, and forgiveness no matter what happens to you, you will change into the beautiful loving soul that you are, and everyone will see your light shining out and want to be with you and do what you are doing. 5.0 out of 5 starsA must read for anyone who believes an unexamined life is not worth living! This is an amazing book for anyone on a spiritual path....it is all about how to understand the low grade struggle we all live with each and every day... how we cling to everything that makes us feel good and how we resist anything we don't like... instead of understanding that all of it is life.. and the only way to achieve true joy is to understand our struggle and to slowly open to life just as it is... right here, right now. I love this book and am currently doing her 10 week program with a small group of like minded people and we are all impressed by her insightful presentation. 5.0 out of 5 starsReal, real good. I got this book when the sounds true lady emailed me and said I usually don't do this, but everyone get yourself this book; here's the first 40 pgs. There's something special in here. I've read so many of the self help authors it's gross, but this book is real and practical and changes you as you read it. I never felt like I needed to go back a chapter and re-read because I got it and have already transformed past that point. It gives you something you can physically do every second, which is live from a place that does not struggle so hard, and can still be there for you when it is super hard. Peace! I absolutely loved this book. I shared something from it at a caregivers support meeting and was gratified to find one person actually bought the book and they love it, too! I'm going to be reading it again immediately--the writing is clear and the metaphors beautiful. Rather than self-help, I would call this self-care for humans who struggle in life to connect with the love within themselves. Very encouraging and loving.